Jenny Jump State Forest stretches between the four Warren County Townships of Frelinghuysen, Hope, Liberty, and Independence some 12 miles southeast of the Delaware Water Gap. 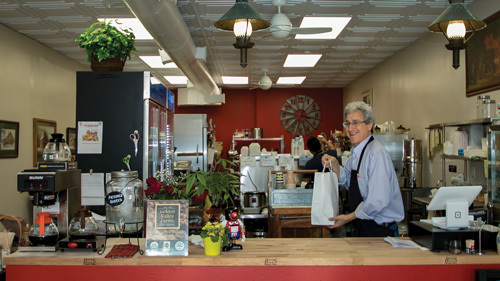 Park headquarters and the main section are perched between the historic villages of Hope and Great Meadows, while the most southerly segment approaches Mountain Lake just north of the Pequest River at Buttzville. 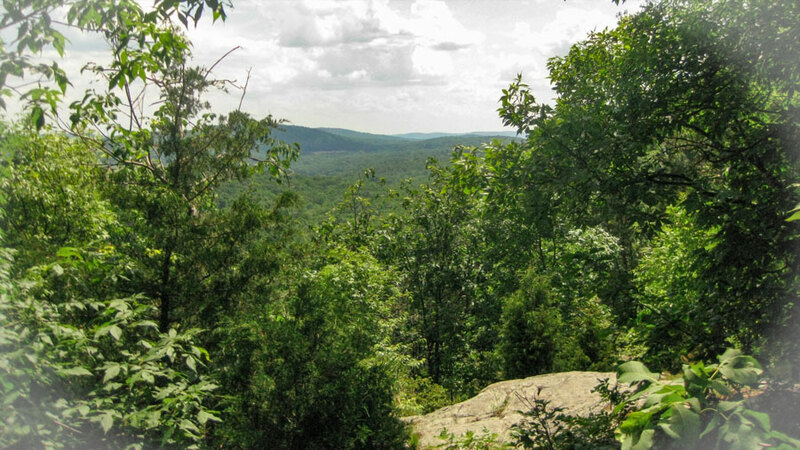 The ancient rolling terrain of Jenny Jump Mountain provides spectacular vistas of the Kittatinny Mountains and the Water Gap to the west, and the vast panorama of the Great Meadows to the east. A haven for those who love a hike and a good view, the Park promises special rewards for devotees of geology, astronomy, mountain biking, bird watchers, bass fishing, and all season camping. The forest contains outcroppings estimated to be 1.6 billion years old, some of the oldest rocks on earth, whose banding marks belie their origins deep beneath the earth's surface. Later lifted by intercontinental collision to form ancient mountain chains 15,000 feet high, this fault is part of a larger ridge and valley geologic province that stretches to Alabama. Much later, only 21,000 years ago, a glacier's terminus a few miles south meant the birth of Great Meadows and the Pequest River. Water from the melting glacier accumulated behind the terminal moraine to form the prehistoric Lake Pequest. The lake's outlet waters eventually cut through the natural dam, draining the lake, leaving muck soil formed from the decomposed organic matter that accumulated on the lake bottom. In the late 1800s, areas were cleared, drained and used for intensive cultivation of vegetables and sod in this uniquely fertile soil, the Great Meadows. The glacier, which was over a mile thick, finally receded 21,000 years ago, leaving behind moraines, kettle holes, erratics, and other features. An erratic is a rock that was transported by glacial ice to its present. site. 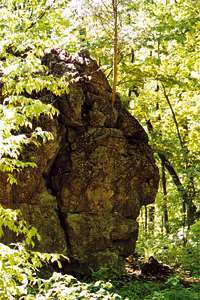 Limestone boulders, originally part of the 500 million year old Kittatinny Limestone formation, came from the Kittatinny Valley to the northwest. This boulder came from the valley near the Paulinskill River and is approximately 470 million years old. A geologist can go to school along the nine miles of hiking trails at Jenny Jump, lined with glacial debris plucked from mountaintops and left here where the mile-thick sheet of ice ceased to advance. For the rest of us, these monumental features remain captivating, but strangely out of place. Over the shallow bedrock and between huge boulders and ledges lives a mature hardwood forest, some of whose trees have invaded the rock with roots wedged in ever widening crevices. Rows of white pine, planted by the Civilian Conservation Corps, fringe the hardwoods. 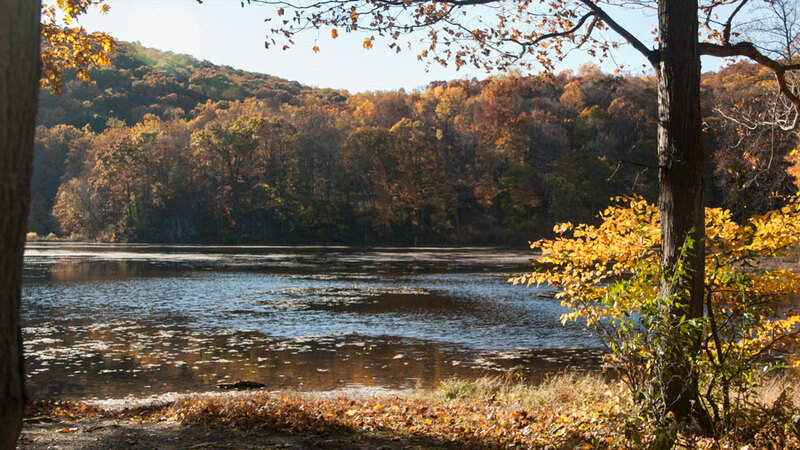 The Corps, who occupied this land in the 1930s, also built the original roads and the Orchard Trail picnic area, probably planning a public recreation area even before its acquisition by the State of New Jersey. Beginning near park headquarters, the Summit Trail reaches its peak at 1090 feet where it meets the Ghost Lake Trail which winds down the southeast side of the mountain. Ghost Lake, also accessible from Shades of Death Road for car top boat launches, offers great bass fishing before it is overtaken by weeds each year. Man made and fed by an artesian well, the lake reaches a maximum depth of only 10 feet. 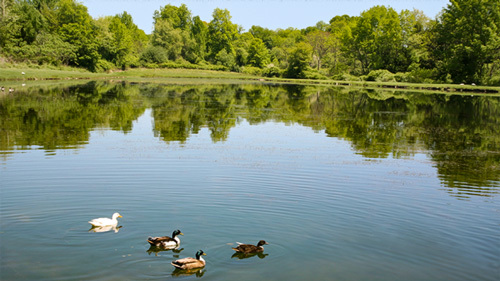 Park management has acquired a grant to address the weed problem and extend the lake's life. On the southeast side of the ridge in the park's main section sits the Greenwood Observatory, established by the United Astronomy Clubs of New Jersey in 1992. At its 1,100 foot perch, the telescope is not only a little closer to the stars, but enjoys one of the few "dark sky" locations in New Jersey, relatively devoid of light source pollution. The facility is a 10' x 10' roll-off roof structure housing a 16 inch Newtonian Telescope for use by all UACNJ observers and for public programs. On the property, a building, converted from a private residence, houses a lecture room for public programs, a sales desk offering books and other astronomy related items, a display room, a radio astronomy/ham-radio room, and a maintenance shop. The upstairs has a large meeting room and an office/library. For those wanting to observe all night, a full kitchen, bath, and a bunk room are available. The 16 inch telescope magnifies up to 800 times which allows you to see Venus, Mars, and more remote planets; hitch your wagon to other galaxies and nebula (remnants of an exploding star); or have an up-close and personal with the man in the moon. There are two hour programs each Saturday evening from 8-10 pm which may include topics ranging from a children's guide to the stars to current issues in astrophysics. Subjects for the weekly programs are announced at the park office or on the UACNJ website. Whatever your particular interest, you will enjoy an enthusiastic group of hosts, eager to help you on your way across the universe. The relationship between the Park and UACNJ, actually a a loosely associated umbrella networking group for New Jersey area amateur astronomy clubs, has been a fruitful one. Five additional observatories are under construction, three of which will be run by member clubs. The UACNJ will maintain a solar and a research observatory with a special chronograph and a hydrogen alpha telescope which looks at the sun in red wavelengths. A seventh observatory is in the planning stages and will house the recently donated 28 inch reflecting telescope in a building on top of mountain with full domed roof. When these projects are complete, the UACNJ facility at Jenny Jump will be the largest in the tri-state area dedicated to amateur astronomy. The Park's main section and headquarters are located off of Route 519 just northeast of Hope. On the southwest side of the village, also accessible from Route 519, lies another non-contiguous section of Jenny Jump State Forest. Acquired by the state in the1930s (but not part of the original CCC camp, this heavily wooded section overlooks Mountain Lake, a residential community. A five mile, multi-use, trail loop is accessible from a parking area on the north end of the lake. The rugged trail is not groomed, but it is clear for adventurous mountain bikers who can append a rough ride with a smooth cruise around the lake and stop for a bite to eat. Camping at Jenny Jump takes place only in the main section, where there are 22 tent and trailer wooded sites with fire rings and picnic tables. There are also two group sites that will accommodate 25 and 40 campers. Jenny Jump is one of two New Jersey State Parks that offers shelters, each of which has a living room with a woodstove and double-deck bunks, with showers and toilets located nearby. The shelters, which will comfortably accommodate four people during any season, can be rented by the night. Since there are only eight of them however, you should book well in advance. 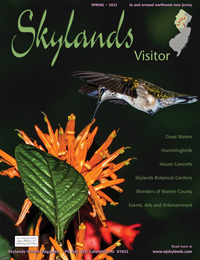 For more information write Jenny Jump State Forest, Box 150, Hope, NJ 07844 or call 908-459-4366.